I had to reformat my machine because I had a virus. My machine did not come with a driver disk. How can I install drivers after having reinstalled Windows? Most manufacturers let you download drivers from their website by entering your computer's model number or serial number. Here are links for a few of the most popular laptop manufacturers. You can usually find manufacturers' driver sites by googling manufacturer name drivers. Some manufacturers will provide a single download for all the drivers for a given model, others will make you download all of them. You should always download graphics drivers and chipset drivers if they are available. See if Windows' default drivers will work for network cards. If your computer has special keyboard buttons, like volume keys or a backlight, you should download the drivers for those. Other drivers may be optional. Windows Vista and later have excellent built-in support for finding drivers automatically through Windows Update. As soon as you can get your network drivers working, run Windows Update and look for any driver updates suggested. Once you have installed these, go ahead and find the rest of your drivers. What you want to do is look up the PCI Device ID for each of these devices, then look them up on PCI Vendor and Device Database (which as of this edit has been offline for some time--as an alternate you can try PCI Lookup). This site can tell you the manufacturer of almost any device, and can often determine what the device is. You can then use this information to search online for the driver. Try to find the driver from the device manufacturer's website if possible, using 3rd party locations as a last resort. If you do have to install drivers from a 3rd party site, scan them thoroughly for viruses and check that they are digitally signed. To find the PCI device ID, right-click on it in the device manager and choose properties. Go to the details tab and select Hardware IDs from the Property drop-down box. The vendor ID is the string following VEN_ and the device ID is the string following DEV_. For example, the hardware ID string for my wireless card is PCI\VEN_14E4&DEV_4727&SUBSYS_145C103C&REV_01. The vendor ID is 14E4 and the device ID is 4727. 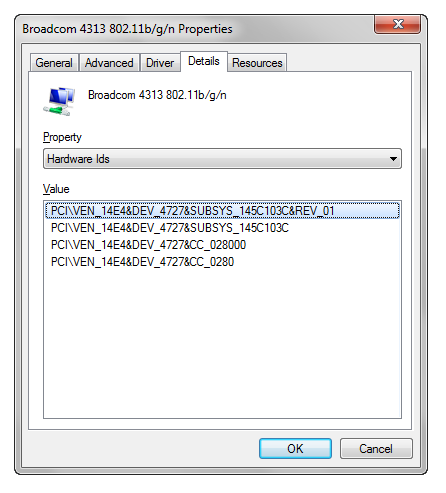 Putting this info into the PCI database reveals that it is a Broadcom Wireless-N WLAN card. You can then use a search engine to find drivers from Broadcom. If you can't find them on the site of the computer's manufacturer (I know Dell is very good about this; some smaller companies might not be so good), you will have to identify each component, and go the manufacturer of each component's site. You could also use DriverMax to detect and download the drivers. The best software for identifying your devices is Unknown Device Identifier. It will give lots of info about a device, and also help you find a driver for it. There are heaps of other products or services that help find drivers. I suggest extreme caution when using any of these products. You should at least ensure that you have backups of all data, and create a system restore point. A wrong driver can cause much harm, up to even blocking the boot process. You should contact the manufacturer if you can't find the drivers on their site. Not the answer you're looking for? Browse other questions tagged windows drivers community-faq or ask your own question. How can I identify my network card in my laptop? How can I find out which laptops will fit a 12.5mm hard drive? Where are drivers downloaded from windows update stored? Where does Windows search for device drivers? Why is Laserjet P2035 driver for Windows 7 failing to install? Should I be installing Windows 8 drivers or Windows 7 drivers on a Windows 7 machine?